I pressed the letter into the guard’s hand and expressed to her how important it was. “Get this to Princess Annette at all costs and as quickly as possible,” I said. Ever since her mother, the Queen, was arrested the princess locked herself in the palace. The only way to gain her attention now was to sneak a love letter to her, but I had to be swift. Surely other suitors were attempting to do the same at this very moment. 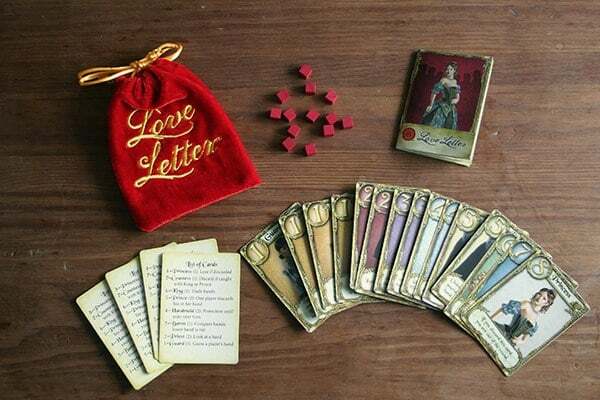 Love Letter is a very easy and fast moving game. The object of the game is to get your love letter closest to the princess while preventing others from doing the same. Each round represents one day. When the princess has received enough letters from one suitor she grants him permission to court her. Whoever wins the princess’s heart also wins the game. The game has only 16 cards. Each card has a picture of a character, a number representing their rank and text that explains what happens when the card is discarded. The game also comes with 13 wooden tokens used to keep score as you play. The cards are pretty simple and have nice artwork depicting each character. Many players find it fun to replace the tokens, which are small wooden cubes, with small gem hearts easily found at any local craft store. Game play is quite simple. Each player is dealt one card and one card is left out of the game each round. In two-player games four cards are left out. The game starts with the last person who most recently went on a date. On his or her turn a player draws one card and then discards one of the two cards in their hand. As they discard this card face up in front of them they must apply its effects, even if they are bad for them. For example some effects will cause you to be eliminated from the round if you discard that card. Others force a player to discard their card and draw a new one or allow you to peek at another player’s card. The goal is to try to have the highest ranking card in your hand at the end of a round, which can take a little strategy to do. Drawing the princess from the start, the highest ranking card in the game, isn’t always a good thing. A round ends when the deck is empty. All remaining players compare their cards with the highest ranking card winning. The round also ends if at any time all players, but one, are out of the round. The remaining player would then win. The winner of a round receives a token of affection, the cards are shuffled and a new round begins. Once a player receives 4 – 7 tokens, depending on the number of players, they have earned the affection of the princess and win the game. The game is rather fun to play and has a surprising amount of strategy for having so few cards. There is an element of luck at work here too, so those who do not enjoy games where a lucky guess can influence the outcome may not enjoy this too much. The game is very easy to learn and teach. You never have more than two cards in your hand and the cards tell you exactly what to do. Even someone who does not play games often will pick up this game and understand how to play after seeing one turn. The game plays very quickly as well. Once everyone gets the hang of the game it is common to have an entire game done in ten minutes. It is very easy to play several games in a row. It is also a very portable game and easy to take with you to play just about anywhere. It comes in a small red bag embroidered with the name of the game on it. A child should be able to pick up and learn this game very easily once they are able to read and understand the cards. The need to employ an elaborate strategy to win this game is not necessary. Usually the most complex a strategy needs to be is figuring out what cards have been played already to try to guess what might be in your opponent’s hand. Though with at least one card being left out each round you never can truly know. It is most fun to play this game with three or four players, but the game plays with two players surprisingly well. If you are looking for a game with a cute story, simple rules and a lot of replay value I cannot recommend this game enough. It is frequently the game we use to break the ice on a game night with friends and family. There is nothing in this world that a child loves more than playing a game with their parents… Except dinosaurs. I was lucky enough to have a chance to play Super Tooth this past week with my family. I’ll admit that I had my doubts when the game arrived. It looked too simple. But, Super Tooth hides its complexity well. So well, in fact, that you might not notice it if you aren’t looking for it. That is one of the secrets of a good family game in my eyes. Super Tooth is, at its core, a matching card game. Players are tasked with collecting matched sets of plant eating dinosaurs. Each turn a “landscape” of three cards is laid out on the play area. Players will then resolve event cards (like the egg that lets the player bring back a card that had previously been discarded), feed or chase away meat eaters, and then ultimately choose one type of plant eater from the board. There is some luck involved here, but it is important to choose carefully to make sure that you are getting matched sets and not just random cards. The game itself includes the cards (the number will vary depending on how many expansions you are using, and “Cretaceous Coins” that are used to help keep score. The cards were thick enough that they would survive through a lot of play, but it would be best to protect them from little hands whenever possible. They would fit very well in standard card protectors. My youngest son feels left out of a lot of gaming sessions because a lot of the games that cycle through our home require reading or advanced strategies that he struggles with (being five). He was in all his glory while playing Super Tooth. He was able to grasp the basic gameplay mechanics quickly and was able to implement his own strategies after his first game. What turned this pleasant surprise into a best case scenario was the level of engagement from everyone playing. My brother was playing with us and he tends to stick with “deep strategy” games and he enjoyed himself (even if he was getting beaten by a five year old)! Super Tooth may be a matching game at its core, but the way that it is played turns it into a sort of drafting game. Players who pay attention to what other players are picking up and discarding will be able to employ strategies like counter-drafting (taking a card that your opponent needs even if it isn’t beneficial to you). My eldest son did that without giving it a name. Supertooth was picked up by Gamewright for 2015! Find out more here! Robot Turtles is a family board game created to teach kids computer programming. It is simplistic and super fun. The goal is for kids to is to place directional cards on a board to get their turtle to a matching colored jewel. It starts out easy, but as your child learns, you can add obstacles to make it more complex. The children get to be the programmers and take control by playing out cards. The grown-ups act as the computer, following commands and making all sorts of goofy noises as they play. The key is that the computer has to follow the commands exactly as entered by the kids. For example, turning left and moving forward twice is different than going forward twice and turning left. It is a sneaky way to instill in children the importance of the order of operations in programming. You might have heard about this game in the news. Maybe you’ve seen someone who has it. Maybe you’ve seen it reviewed on a website. But, you’ve looked everywhere for it. It appears it was only released on Kickstarter and there might be a few copies left online. But it’s crazy expensive. Guess you will never have a chance to get it for your family, right? Thinkfun, one of the top publishers of kids educational games, is releasing a shiny new version of Robot Turtles this summer. And for anyone who preorders, they’ll include a really cool expansion pack. We really enjoyed playing as a family. The biggest draw has been the scaling difficulty. It lets my sons play together despite their vastly different abilities. My 4 year old loved the basic game, and was super excited to have a robotic turtle with lasers. My 8 year old liked coming up with 3 card at a time moves in advance, and my 20 something year old brother-in-law liked writing his entire program up front (he was even able to experiment with function commands) . The game uses simple concepts to sneakily teach computer programming concepts and kids enjoy it. From an educational standpoint, it doesn’t get much better. We definitely think it’s worth preordering a copy for your family.